Let’s time travel for a moment: Twenty-five years ago, sales reps didn’t have a lot of options to engage with prospects and communicate their business and value proposition. As a sales leader, you could either spend hundreds of dollars on plane tickets, hotels, meal plans, etc. to have face-to-face meetings, or have reps simply pick up the phone and dial a number. Fast forward to 2016, and sales development reps are surrounded by technology that provides myriad channels to connect with prospects. Think: email, Twitter, LinkedIn, blogs, message boards, etc. Some reps are so reliant on these types of communication that they don’t ever pick up the receiver. But we know that the best sales professionals speak to the most people, and the most effective way to communicate messaging and address objections is directly over the phone. So here’s how to get your SDRs to pick up the damn phone. 1. Create a call-conducive environment. More than half of organizations in the U.S. embrace the open-office environment. According to the a study by the International Facility Management Association, approximately 70 percent of offices have now or low partitions. This kind of open office environment can often make reps feel less comfortable pounding through phone calls. But don’t freak out! There’s no need to rearrange your entire office. A few simple tricks can help reps feel more comfortable. If your office is noisy, consider purchasing noise-canceling headphones or click-to-call software to make it easier for your reps to hear and seamlessly go from call to call. If your office is quiet, make reps feel comfortable going into a small conference room for an hour to knock out a bunch of calls. If your reps still aren’t making calls, sit at your desk and get on the phone yourself. Be a selling sales leader. Let them hear you in the trenches selling right alongside them. 2. Foster a phone-obsessed culture. We know that reps work on the activities that they think will help them reach quota. So it’s important to help them understand how calls will help them achieve sales goals. You could demonstrate that to hit quota for the quarter, reps need to send out a certain number of proposals. To get to the proposal stage, they need to conduct product demos. And the only way to get those demos scheduled is for reps to pick up the phone and generate leads. While some parts of the sales process are out of rep’s control, help them understand that the number of people they talk to on the phone is something they can control. When reps understand how calling contributes to hitting their overall sales goals (and therefore, compensation plans), then they’ll be more likely to engage in the activity. 3. Motivate calls with KPIs and incentives. Is your defined sales process supported by metrics for each step? Have you defined a specific amount of each activity you expect from your reps each day, month, week and quarter? Maybe you already measure KPIs like number of wins for each rep on your sales team. That’s great! But it’s not a leading indicator, which tells reps what they need to do to reach their goal (instead of measuring what they’ve already done). If you want reps to make more phone calls, establish a KPI for how many you need them to make. Not only do studies show that setting goals makes people more likely to achieve them, but having a real-time KPI for specific activities let’s reps see exactly how many more calls they need to hit their goal. What’s more, you can recognize and reward reps who make the most phone calls (as opposed to punishing those who don’t). Looking for affordable incentives? Click here. 4. Manage with call coaching. Finally, to ensure that your reps make more calls, you have to coach them. Nobody is born with all the skills of a rockstar salesperson. Even the best sales reps can benefit from good one-one-one coaching sessions, as well as tips or not getting deterred by hang ups. In addition to weekly one-on-one meetings, hold targeted reach-out sessions where you walk through a call with reps. (Alternatively, you could have them record their sales calls and then provide them with feedback). Whichever coaching method you choose, make sure to share feedback and tips so reps feel both confident and prepared to pick up the phone. Remember, effective communication is an important first step in closing deals. And if you want your sales development reps to pick up the phone more, you need to create the right environment, culture, KPIs and coaching. Want to know how other sales leaders use KPIs to motivate the activities that ultimately lead to more sales? 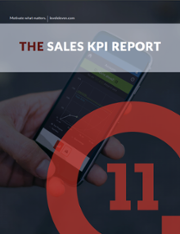 Fill out the form below to secure your copy of the first-ever Sales KPI Report. Some sales development reps are so reliant on electronic communication that they don’t ever pick up the receiver. How to get your SDRs to pick up the phone.